The Basic Classical Notions. &kgr;-Suslin and &lgr;-Borel. Basic Notions of the Effective Theory. Structure Theory for Pointclasses. The Constructible Universe. The Playful Universe. The Recursion Theorem. Metamathematics. 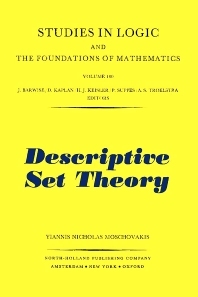 Now available in paperback, this monograph is a self-contained exposition of the main results and methods of descriptive set theory. It develops all the necessary background material from logic and recursion theory, and treats both classical descriptive set theory and the effective theory developed by logicians.